The direction and quality of the light on the subject are the most important keys to image impact. The direction and angular size of the light illuminating the subject determines image impact. Harsh light occurs when the direction creates unflattering shadows and texture. The Color of light can emphasise certain colors in an image. Understanding the angle of light and its effects is key to understanding light, the angle of light and image impact. See parts 2 -5 for details of the angle of light, including phase angle effects. This page describes more advanced aspects of phase angle, and the angular size of the light source that gives rise to harsh and/or unpleasant light versus light making high image impact. Harsh light is directional light that produces high contrast images from an unflattering direction. An example is shown in Figure 1. 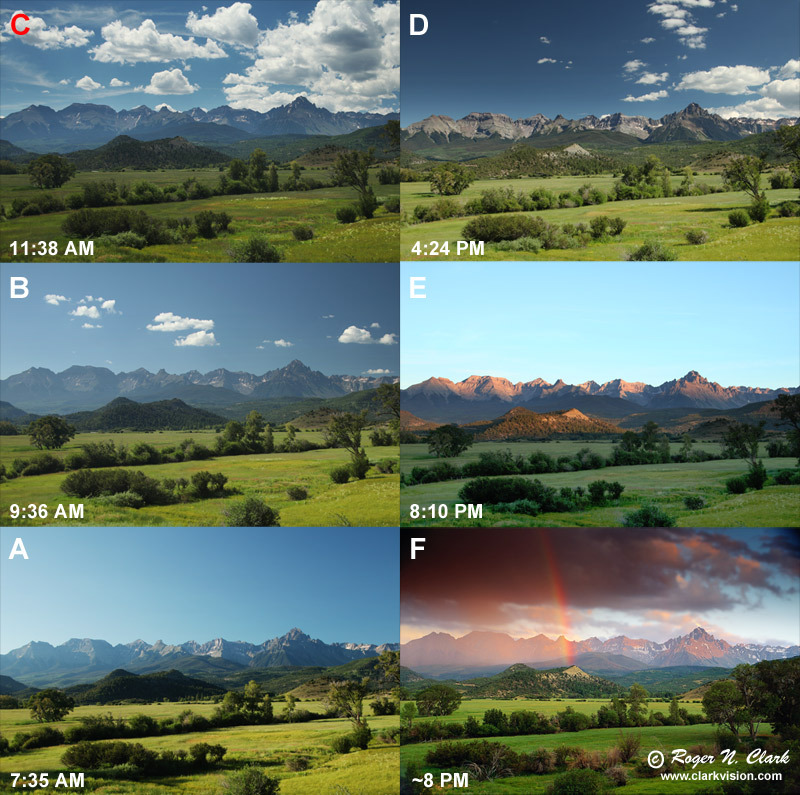 Harsh light affects all subjects, including landscapes (Figure 2), animals (Figures 3a, 3b) and people. It has nothing to do with light intensity. Figure 1. 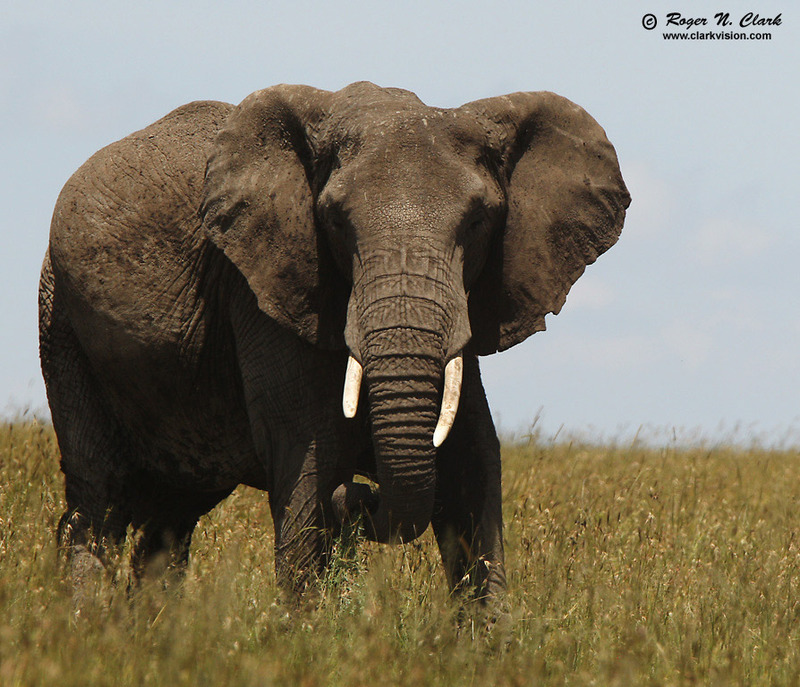 Wild elephant in harsh light on the Serengeti. Figure 2. Colorado waterfall in A) harsh light, and B) soft pleasing light. Figure 3a. 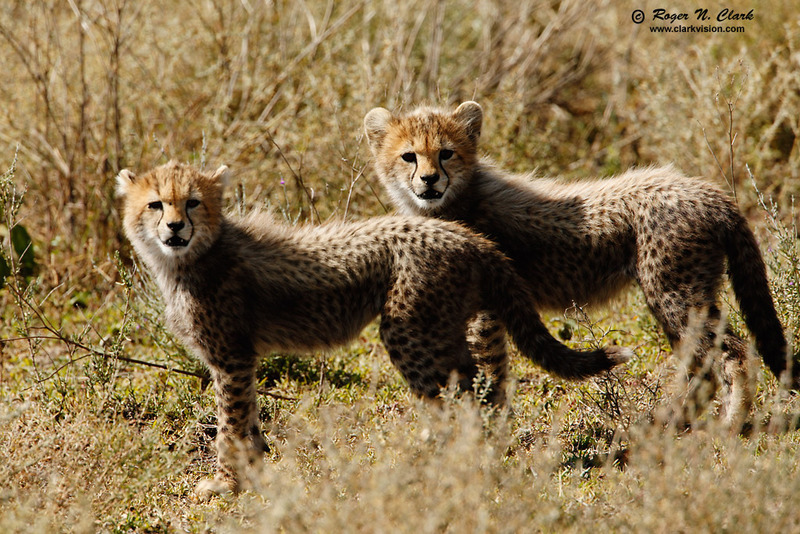 Baby cheetahs on the Serengeti in harsh light. Figure 3b. 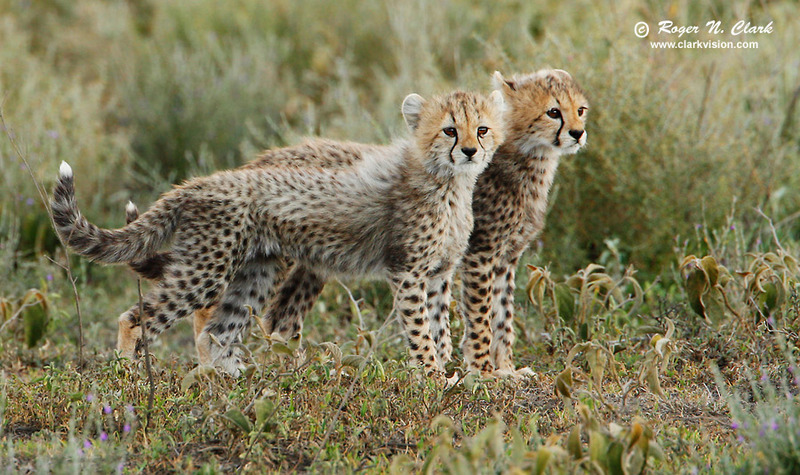 Baby cheetahs on the Serengeti in soft light. Examine the harsh light/soft light images in Figures 1 to 3. What characteristics do the harsh light images have? In each case, the phase angle is about 90 degrees and the sun is high so that shadows are deep and making the subjects unflattering. The baby cheetahs in Figure 3a have a phase angle of slightly more than 90 degress, making the subjects backlit and parts of their faces and bodies in deep shadow. But phase angles near 90 degrees and more are not always bad. Sometimes strong shadows elicit drama and/or power. 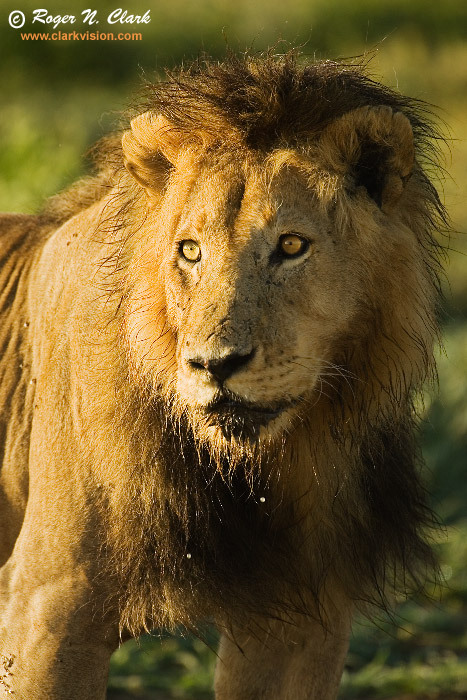 The male lion in Figure 4 is at a phase angle near 80 degrees, but the shading adds drama to the lion, strengthening his power. In this case, the sun was low in the sky and light reflected from the sky and land to the right, out of frame, filled in the shadow. Figure 4. Lion in early morning light. Phase angle is about 80 degrees. Figure 5. 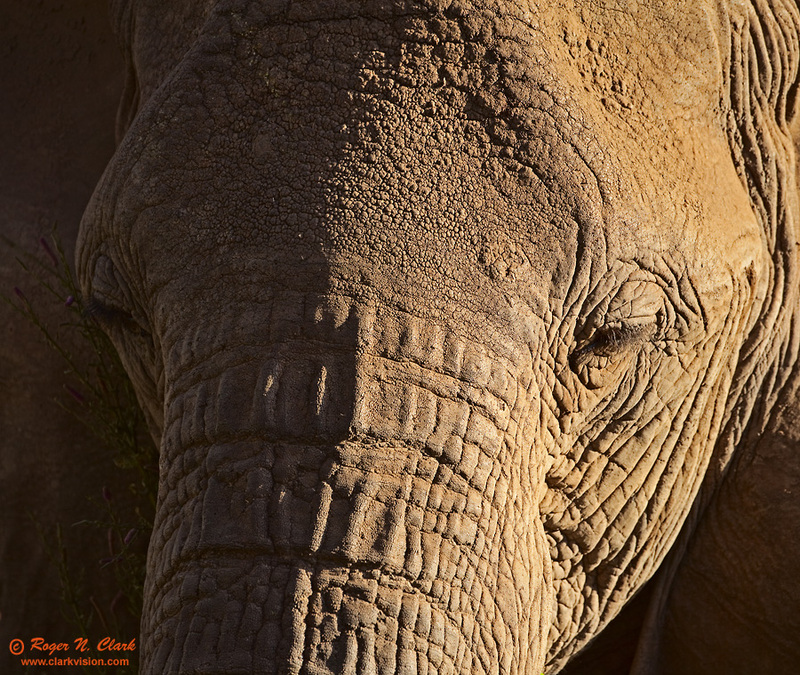 Elephant made at phase angle of 90 degrees, showing amazing texture in the elephant's skin. Compare the images of the elephant in Figures 1 and 5. Both images are at a similar phase angle (near 90 degrees) but the direction and secondary lighting conditions are different. In Figure 1, the sun is high, casting deep shadows on the elephant, resulting in high contrast and thus harsh light. The elephant in Figure 5 has lighting from the side AND secondary light from bushes to the left out of the frame that reflect light into the shadow, mitigating the high contrast. The difference in direction and mitigating secondary light changes a potential harsh light situation into a strong image with form and texture. While direct sunlight can cause harsh shadows, broken clouds can diffusely reflect sunlight from multiple sources onto the subject, creating pleasant effects. Sunlight can also be transmitted through clouds, filling in dark shadows. The color of the light is also important. For example, shadows outdoors are diffusely lit from the sky. A blue sky fills shadows with blue light. An overcast sky produces a blue cast (cooler) because the water in clouds preferentially absorbs red light. A low sun passes through a thick atmosphere causing a redder (warmer) color. Add clouds to the low sun such that multiple light sources illuminate the subject, and this can produce dramatic and spectacular effects. However, too much diffuse light can reduce shading so much that form is lost. Some of these effects are seen in Figures 6, 7, and 8. Figure 6. Images under different lighting conditions. This mountain scene looks different depending on the lighting. The camera color balance is the same in each image to better illustrate the changes. A) Light clouds by the sun blocked direct light, so the landscape is illuminated by blue sky, giving the scene a blue cast with little shading. A different camera color balance can make this scene appear warmer. Phase angle is negative/ B) Direct sunlight at a low angle gives warm light and topography is enhanced by the strong shading. Phase angle is positive. C) High direct sun gives good color but no shadows so the landscape looks flat. 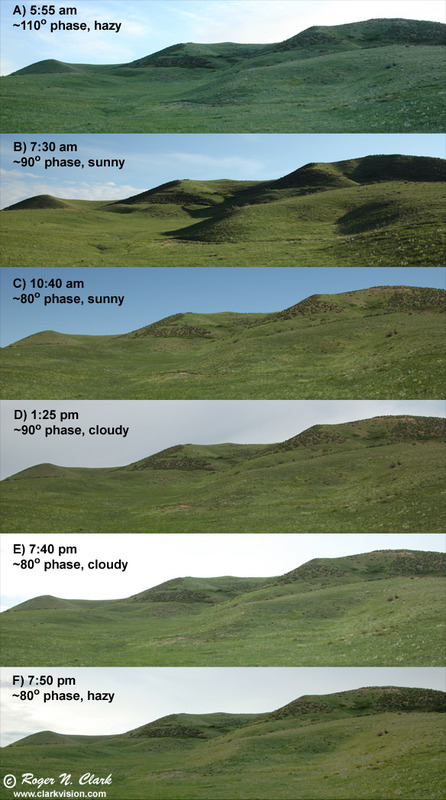 D) High sun on a cloudy day gives diffuse lighting and shows a bright unappealing sky and flat landscape. E) Low sun angle would normally provide nice shading like that in (B), except a hazy sky diffuses the light resulting in unappealing bright sky and no shadows. F) Same as in E. but a small amount of direct sun adds some warmth to the scene and a hint of shading. There are multiple factors that influence the quality of light, including the phase angle, diffuse/directional mix, incidence angles, and color. Some of these quality issues are illustrated in Figure 7. Figure 7. Images of the San Juan Mountains in Colorado. At this location and time of year, the sun rises to the left, rises to mostly overhead and sets to the right, so the phase angle varies little (about 100 degrees in A to about 60 degrees in E). The altitude of the sun and the atmospheric opacity greatly influences the quality of the light. 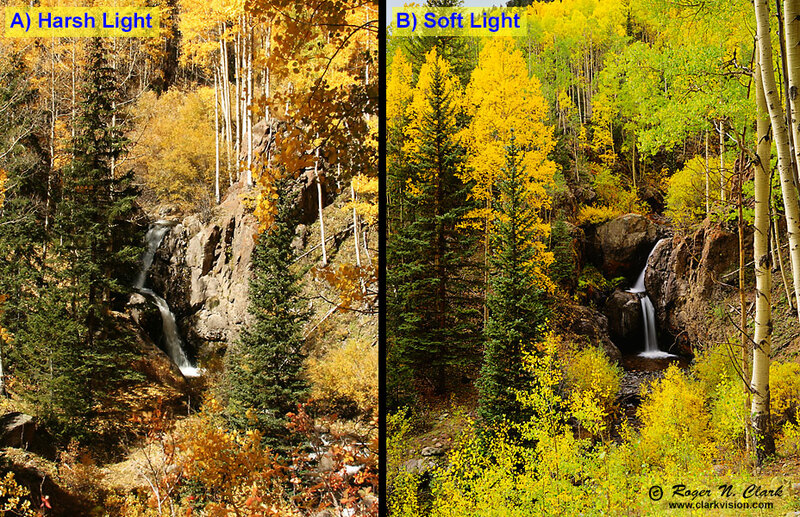 Can you identify the positive and negative quality of the light in each image? See text. Images A - E were obtained in July 2009 with a cannon 1D Mark II digital camera. Image F was obtained on Fujichrome Velvia slide film in 1993. Examine the different views in Figure 7. Image 7A, taken in early morning light that would normally be good has some undesirable qualities in this image. 1) the phase angle is slightly greater than 90 degrees for the general direction of the mountain range, putting the mountains predominantly in shadow. 2) The clear sky adds a lot of blue light to the vegetation, reducing the green color, and 3) haze in the distance reduces contrast. The images were taken with a polarizer to reduce these effects. The image has low impact, especially with the blue sky with no clouds that takes up half the image. Image 7B, taken a couple of hours later on the same day has increased haze and a higher sun angle reducing the shadows. The white puffy clouds are a nice addition. Image with a polarizer. The image still has low impact. Image 7C was taken mid day so shadows are only under the trees and bushes. Haze and the high sun angle minimize shading on the mountains resulting in poor expression of their majestic character. The clouds are brighter than the land, pulling the viewers eyes to the bright clouds. Image 7D, taken in late afternoon (with polarizer), phase angle about 70 to 80 degrees shows nice lighting on the mountains. The low sun angle shows nice shading on the mountains, helping to illustrate their rugged nature. The clouds make the sky more interesting, but the lighting on the foreground vegetation is harsh (the full resolution image does show nice detail in the leaves which overcome much of this problem that can't be illustrated here). Image 7E, taken near sunset on a cloudless day shows nice lighting and shadows on the mountains. The foreground vegetation is in shadow illuminated only by the clear blue sky, reducing the green color. The clear blue sky lacks character. The blue sky illuminating the vegetation in shade gives a blueish cast to the vegetation. The phase angle to the tallest mountain, 14,150 foot Mt. Sneffels, is about 60 degrees. Image 7F, illustrates one of those "WOW!" moments. Taken near sunset, the image would have been a winner without the rainbow. The orange color of the clouds add warmth to the entire scene, reflecting light onto the green foreground fields, giving the vegetation a warm color. The shading on the mountains of 60 degrees phase angle (at Mt Sneffels) brings out their ruggedness. The rainbow puts the image over the top. The phase angle of the rainbow is 42 degrees. Some subjects may appear better with diffuse lighting. For example, flowers. Flower photography can be great on a cloudy day (see Figures 8 and 9, below). While a low sun casting shadows can give depth and texture to grand landscape images. not all subjects look good with strong shadows. Flowers are one example. 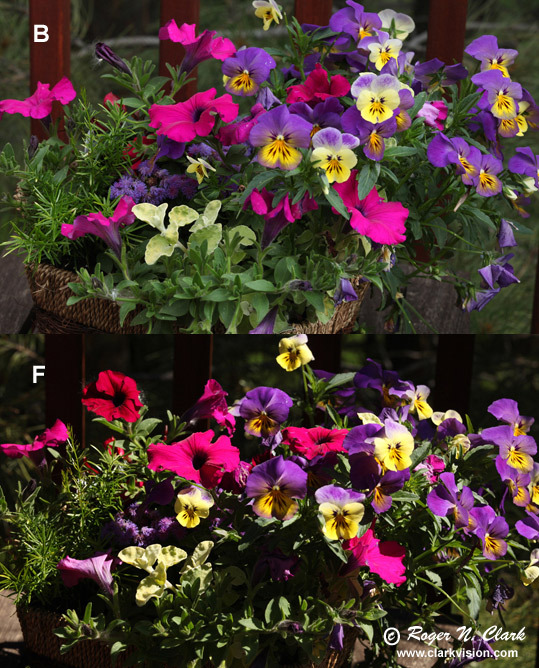 Figure 8 shows two extremes in lighting on flowers. Clearly the shadows and direct sun with specular reflections dominate the beautiful colors of the flowers. Figure 7. Images of flowers with extremes in lighting. The upper image has diffuse lighting while the bottom image has direct light from a sun high in the sky. The "B" and "F" refers to images B and F in Figure 9. Figure 9. 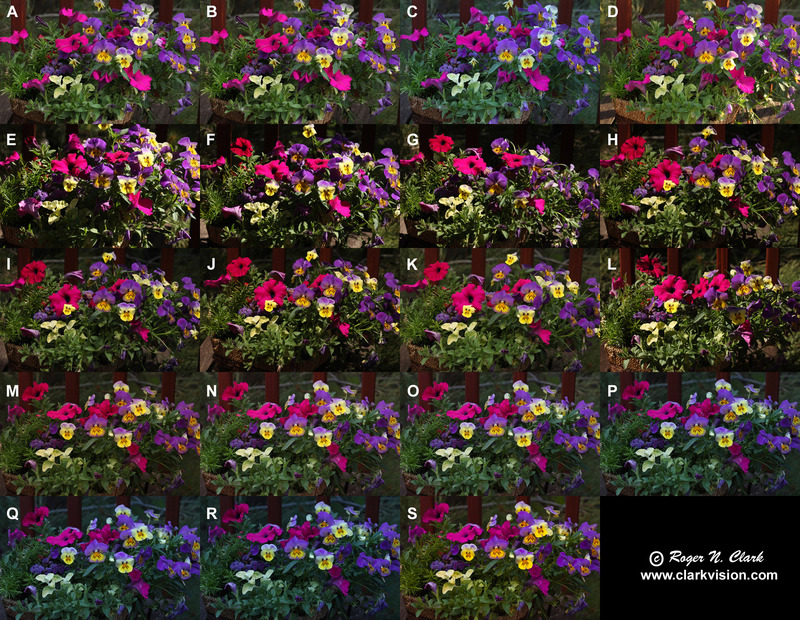 Images of flowers with 19 different types of lighting. See Table 1 for details. Click HERE for a larger view of this image (1.8 megabytes). Table 1. Lighting for flower images. All images at 100 mm, f/11, ISO 200, June 5 and 6, 2009. Sunrise was 5:33 AM, sunset 8:25 PM. All images are from in-camera jpegs with the same color balance and stretch except image S, which is raw converted to give a warmer color balance. All images were evaluative metering at -2/3 stop. A) Diffuse lighting, heavy overcast, no shadows. 7:30 PM. Exposure = 1/4 sec. B) Diffuse lighting, heavy overcast, no shadows, some orange clouds. 7:50pm. Exposure = 1.6 sec. C) Diffuse lighting, half blue sky, half clouds, one cloud brightly lit by setting sun. 8:23 PM. Exposure = 1.3 sec. D) Diffuse lighting. Mostly blue sky + reflection off one large white cloud. Flowers in shade. 6:23 AM. Exposure = 1/10 sec. 100 degrees phase. E) Flowers lit by direct sun, ~80 degrees phase angle. 9:17 AM. Exposure = 1/160 sec. F) Flowers lit by direct sun, ~60 degrees phase angle. 10:01 AM. Exposure = 1/200 sec. G) Flowers lit by direct sun, ~40 degrees phase angle. 11:12 AM. Exposure = 1/250 sec. H) Flowers lit by direct sun + 20% white puffy clouds. ~30 degrees phase angle. 12:09 PM. Exposure = 1/400 second. I) Flowers lit by direct sun + 20% white puffy clouds with a small cloud over the sun. ~30 degrees phase angle. 12:10 PM. Exposure = 1/125 second. J) Flowers lit by direct sun + 50% white clouds. ~30 degrees phase angle. 1:14 PM. Exposure = 1/400 second. K) Diffuse lighting with large cloud over sun. Sun with blue sky around horizon. Exposure = 1/50 second. L) Flowers lit by direct sun + 50% white clouds. ~80 degrees phase angle. 5:05 PM. Exposure = 1/250 second. M) Flowers lit by diffuse light from the sky at sunset. Flowers in shade, clouds were orange, covering 30% of the sky, 70% blue sky. Exposure = 1/2 sec. N) Flowers in shade at sunset, diffuse lighting, 70% blue sky, 8:20 pm. Exposure = 0.8 sec. O) Flowers in shade at sunset, diffuse lighting, 70% blue sky, 8:23 pm. Exposure = 1.3 sec. P) Flowers in shade at sunset, diffuse lighting, 70% blue sky, 8:25 pm. Exposure = 1.3 sec. Q) Flowers in shade at sunset, diffuse lighting, 70% blue sky, 8:39 pm. Exposure = 8 sec. R) Flowers in shade at sunset, diffuse lighting, 70% blue sky, 8:41 pm. Exposure = 10 sec. S) Flowers in shade at sunset, diffuse lighting, 70% blue sky, 8:41 pm. Exposure = 10 sec. This is the same image as (R) except the image was converted in Adobe Camera Raw with a white balance setting of 11,000 degrees Kelvin. The image sequence in Figure 9 shows that images of flowers in direct sun have strong shadows that dominate the image. Specular reflections in direct sun also hides colors and masks subtle shading seen under diffuse lighting. Diffuse lighting displays a wide color balance range, but that can usually be corrected by recording raw data and selecting the color balance during raw conversion (e.g. compare Figure 9R and 9S). Note how the color of the light changes the perception of color in the flowers. For example, blue sky de-emphasizes reds. Images 9N through 9R have increasing contribution from a deepening blue sky as sunset fades. The images become more blue, and emphasize the blue and purple flowers. Compare image 9S with 9A and 9B. Image 9S was converted to a color balance close to that in 9B, but the bluer sky in 9S emphasizes the blues and de-emphasizes the reds. The metering for the images in Figure 9 was compensated to -2/3 stop. The reason for this is that strong colors, especially reds, yellows, and blues tend to saturate. The light meter in most cameras is less sensitive to these colors. In the case of the flower images, the red flowers saturated the red channel with standard metering. I monitor the histogram for all colors on the back of the camera to be sure no channel saturates. As in landscape photography, having the light source overhead results in generally undesirable photographs, especially with the sun in a clear blue sky. Such light is generally very harsh, meaning very directional and for animals and people casts sharp shadows. For example, people's eyes appear in deeply shadowed eye sockets. Figure 10 illustrates this effect with a teddy bear. Figure 10. A low sun angle, A, gives more pleasing lighting than overhead (noontime) sun in a clear sky. The sun overhead casts deep shadows on the subject's face. Compare 10B with 10A: the phase angle is nearly the same, but the sun is overhead in image B and about 30 degrees up from the horizon in image A. Even with the sun low, the angle of the incident sunlight and the camera (the phase angle) are important. As with the flower example in Figure 8, the phase angle greatly influences the lighting effect on people and animals. Figure 11 further illustrates phase angle effects on a teddy bear. At high phase angles, the shadows are strong, but can be dramatic (as shown in Figures 4 and 5, above). Figure 11. Phase angle effects on face and body. The sun is about 30 degrees above the horizon. The angle(s) and color of light are important for images with impact. Some subjects can have strong impact with directional light from the optimum direction(s) (e.g. side light), but not other directions (e.g. overhead light). Other subjects are seen and photographed with more impact in soft light. A mix of soft and direct light can occur on partly cloudy days. The color of light also varies with direct sun in a clear sky, to diffuse light from a blue sky with the subject in shade, to rapidly changing colors of clouds illuminating the landscape near the rising or setting sun. Identifying the varying angles of the light on the subject and its color are key to making images with impact. Last updated November 17, 2014.